I still do late-night sewing. And I still make gifts. With so many friends who stitch and make quilts, the gifts tend toward things they would use while they stitched. Or practical things – it’s the adult-equivalent of socks or underwear. Shhhh… here are a few of the things that I have fallen in love with this past year, things friends just might be getting in their stockings. Screw-B-Do. I’d like these even if I didn’t like Joseph, the lovely gentleman who invented them. I change the needle on my sewing machine every time I clean and oil it, which means fairly frequently. 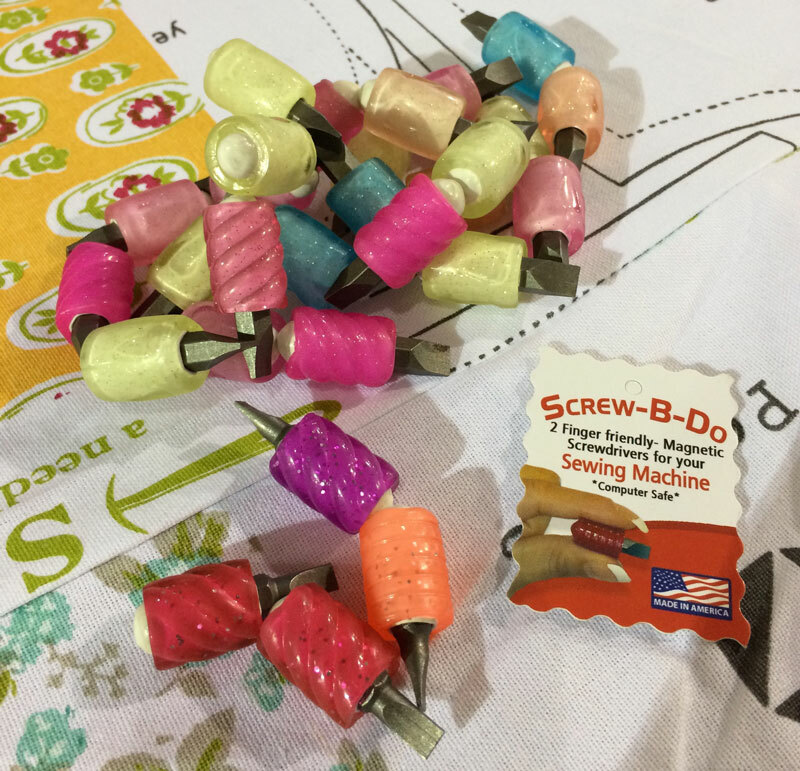 These little screwdrivers – Screw-B-Dos – make the task very easy. And they’re cute. That always counts a lot for me. They’re packaged in a cute little bag with two “Screw-B-Do”s. Quiltmania Simply Moderne and Simply Vintage. 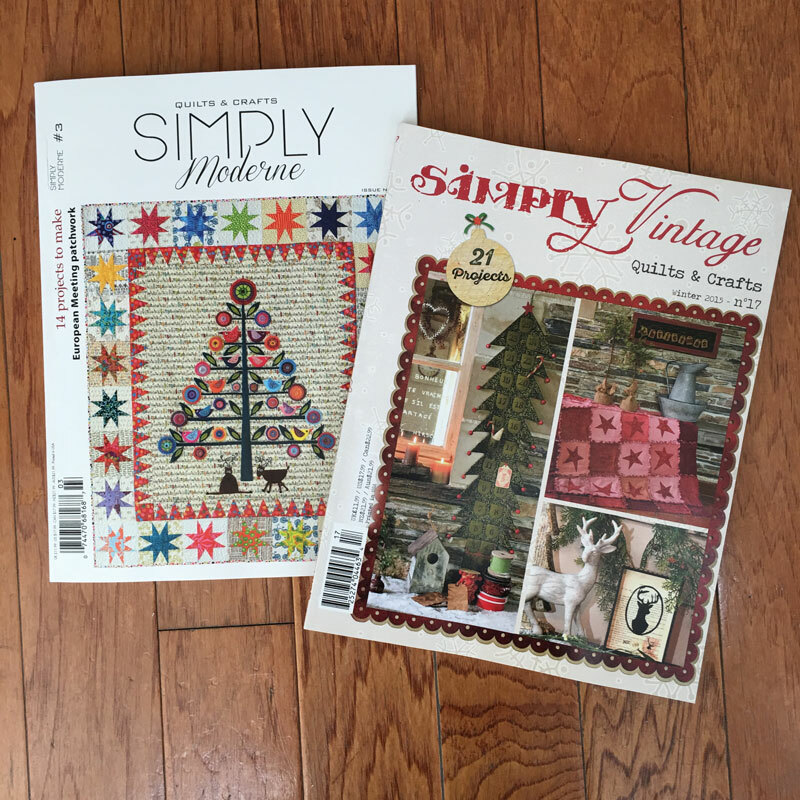 These special editions of Quiltmania magazine are always full of terrific projects, eye-candy pictures of quilt shops, shows and events. These are the two most recent issues and it’s unanimous in the office – both issues are “keepers”. Moda Sampler Shuffle. Don’t worry if you’re missing a few of the blocks, they’ll all be available for a limited time in January. Trim the patterns to 5 1/2″ x 8 1/2″ and put them in a pattern bag – maybe with a note about doing a sew-along. Add a Layer Cake and this would be a terrific gift for a quilter-friend. The Strawberry Fields Revisited by Fig Tree & Co.? That’s a Layer Cake that’s been opened up, folded and packaged like a mini bundle. It’s even more cute in person. 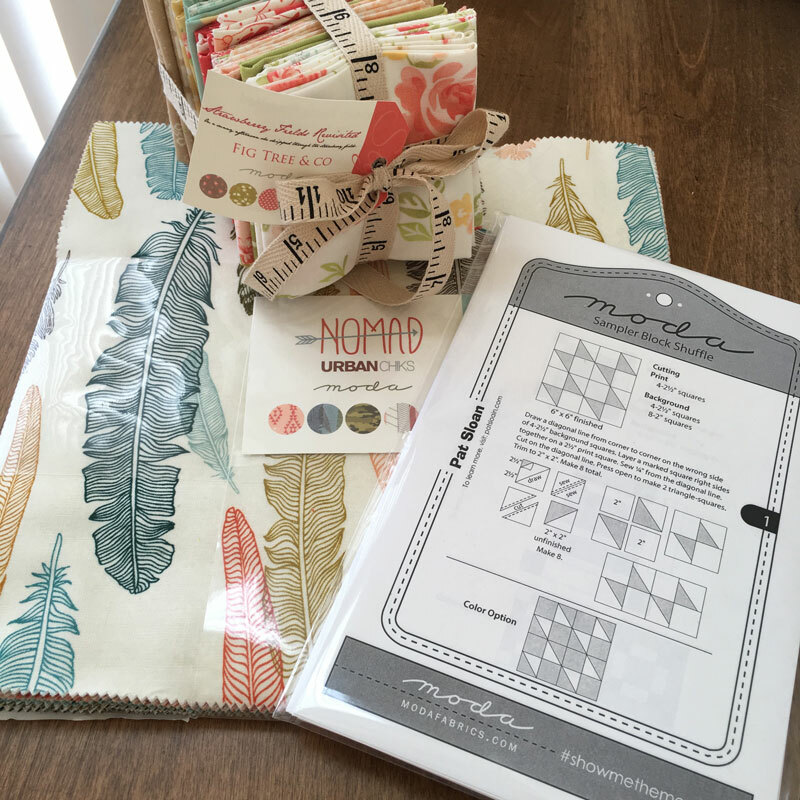 The Nomad by Urban Chiks – it’s mine, I’m hoarding. Pincushions – Handmade Gifts. It’s not too late to get a gift made – something small, not overly complicated and really, really cute. 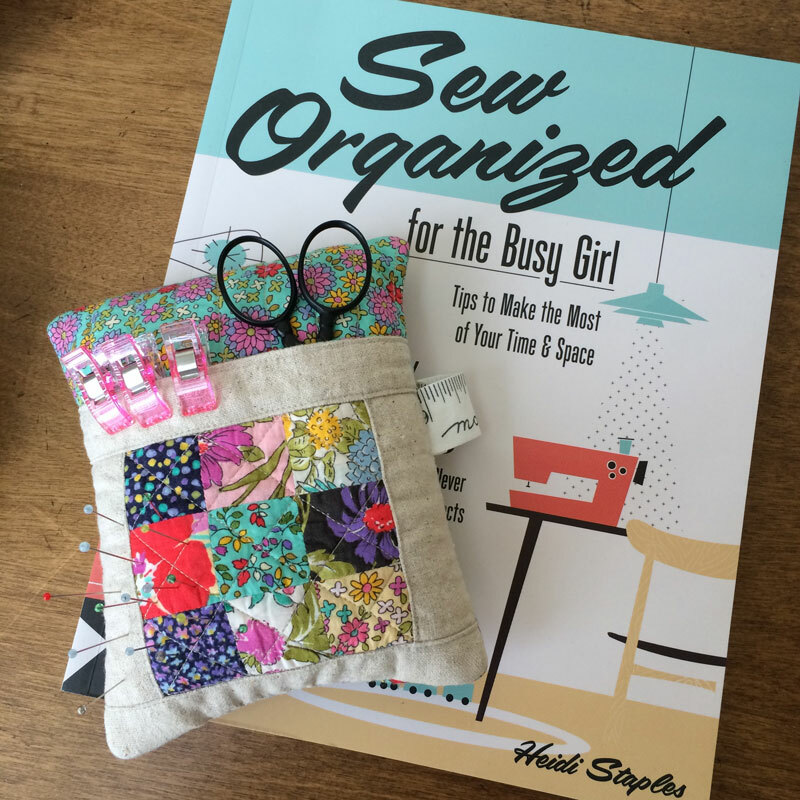 I love this pincushion from the terrific book – Sew Organized for the Busy Girl by Heidi Staples. Towels – Moda Toweling. 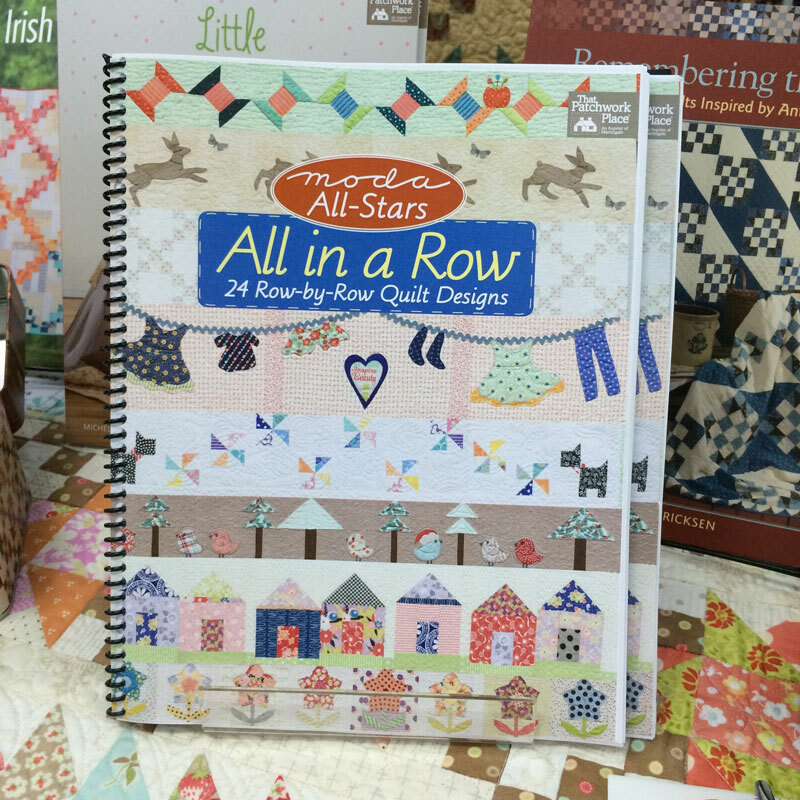 I think you already know I’ve fallen in love with Moda Toweling. What you may not know is that I didn’t think I would like it… I’m kind of a towel-snob. Make that a kitchen-snob. It comes from working almost seven years in an upscale kitchen store. 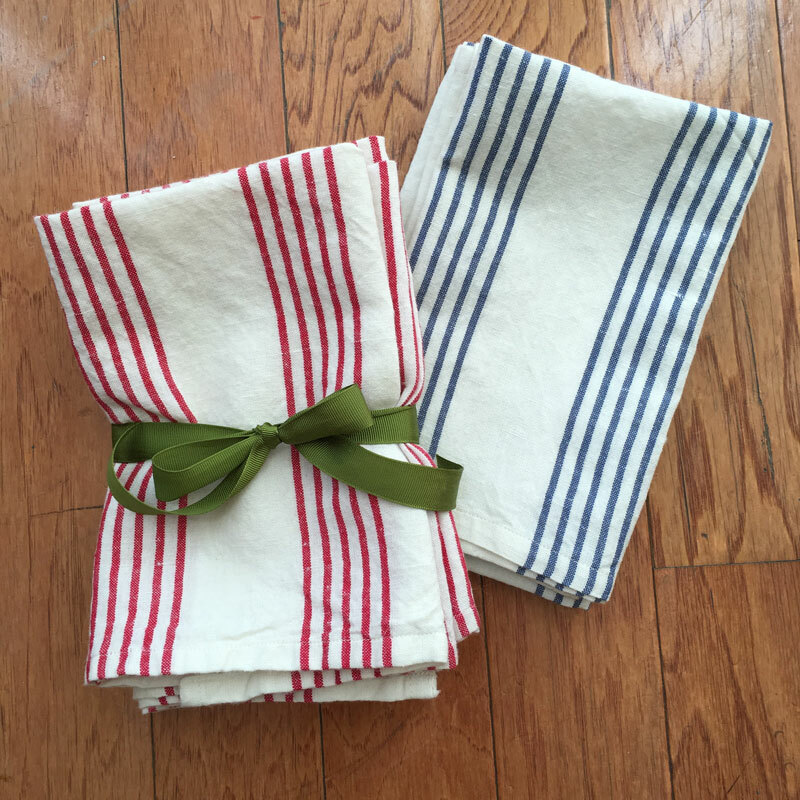 I love good kitchen linens – especially towels and cloth napkins. But I’m always game to try something new – quality-control, product-testing, market research and all that. The cream solid towels in the back are the Barkcloth 16″ Toweling in Fog. The blue stripe and red stripe towels are both by French General – they are predominantly cotton with a little bit of linen. The barkcloth and French General towels are soft, thick and nubby after washing, they feel like old linen or hemp. The stripe on the bottom is the regular cotton toweling. It’s not quite as thick as the first two but it’s still thicker than most of the towels available ready-made. Two things to mention if you’re making these into towels. First, folding over the ends makes for a very thick, bulky corner that can be a little bit hard on your needles. To get that end double-stitched, it worked best for me to always be stitching forward. As in – turn the piece around to do the second and third lines of stitching instead of just “reversing” the stitching on the machine. I’m not sure why it works but it did for me. Second – I like cutting the lengths for the towels at 22″ to 24″ long, more like an old-fashioned dish-cloth than a regular towel. It’s just what I prefer. It also lets me use the towels as “lapkins” – rectangular cloth napkins. I’ve used cloth napkins for more than 20 years now – it was an Earth Day thing, using cloth napkins is generally more environmentally-conscious than using paper napkins or paper towels. Three – I thought of one more thing. Needle – use an 80/12 or 90/14. Thread – a regular 50 wt. is fine but for the thicker toweling, a 40 wt. will show the stitching nicely. Linen Closet Linen-Cotton Toweling. As soon as this came in, a couple people knew I would want to try it. 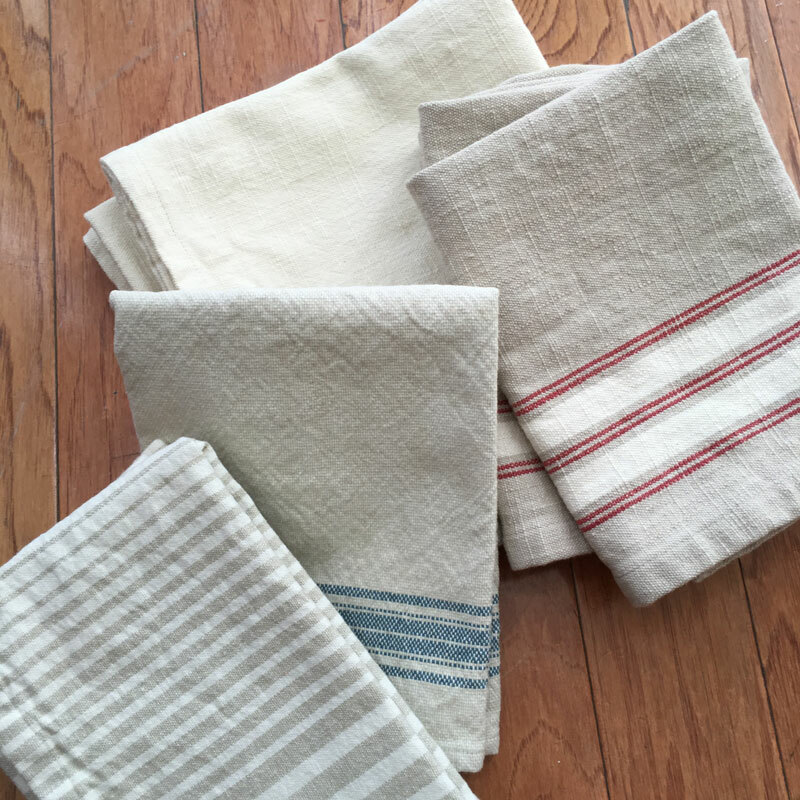 The finished, washed towels look and feel like vintage French linens. These pieces were left after the samples were cut for the reps so I trimmed them to my preferred size – 24″ – and hemmed the ends. This fabric is 45 % linen and 55% cotton, and the weight is beautiful for napkins, cloths and towels. It’s thinner than the barkcloth and the regular toweling, but not as thin as the plain feedsack cloths available ready-made. Note: Just so you know, all of these towelings will shrink when washed. With a finished, hemmed size of approx. 22″, some of the towels shrunk 1/2″ in length while the barkcloth shrunk almost 1″. Moda Frivols. 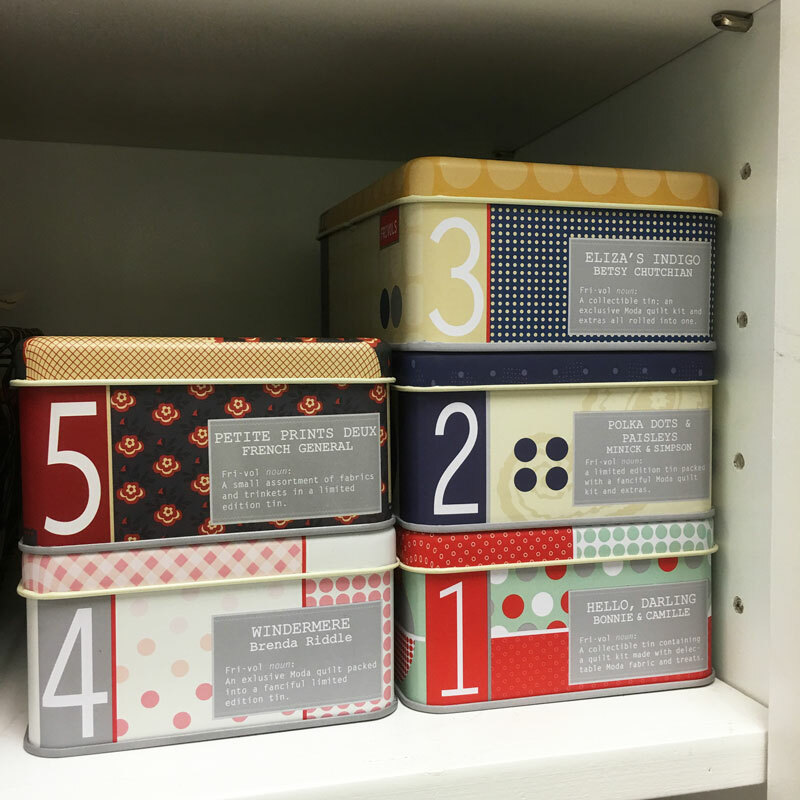 I’m biased but I think these tins make terrific gifts – several friends have whined hinted about putting them on their Christmas lists – they’d like an extra one (or two) of their favorites. I’ ve been filling my Frivols with stitch-y stuff as soon as the quilt is made – it’s actually been an incentive to help me get it done quickly. The quote cards are pinned on my bulletin board and one of the tins has all the little extras from the other tins. I can’t decide if I like them with the numbers facing out – or with Moda facing out. Pins. This probably should be up with the pincushion! 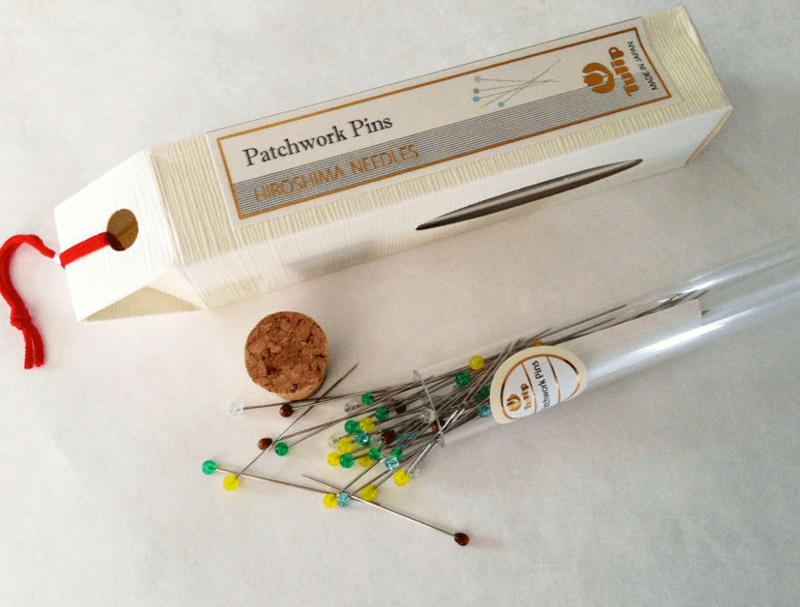 I didn’t think I would notice a difference between pins… not until I was given a package of Little House Patchwork pins from Japan. Life-changing. If you don’t believe me, I can provide the names of friends who I’ve given the pins to since. It’s unanimous – really good pins make a huge difference. My other favorite are the Patchwork Pins by Tulip. Fine. Strong. Very smooth. Very sharp. Christmas in July ~ July. Christmas. Ready. We’re back on Friday with cookies. And recipes. 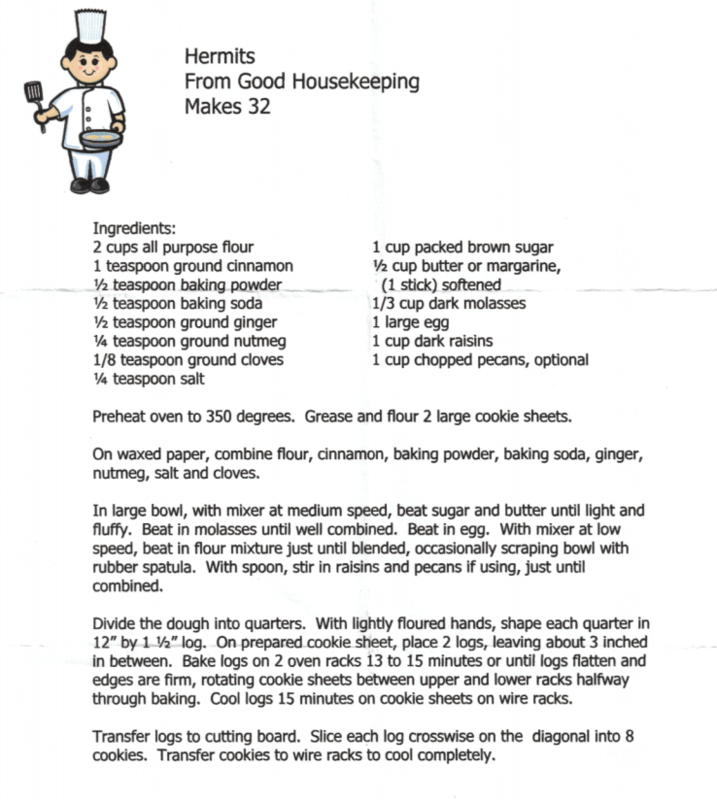 To tide you over until then, I’m going to share one of my favorite cookie recipes. It was given to me by a lovely woman in a quilt class in Dade City, Florida – Sandi. The recipe was originally from Good Housekeeping. I am knee deep in late night sewing at the moment – after work/work and housework (although going back in time to homework would be lovely). It’s touch and go whether or not I’ll make it – but I have just loved seeing your gift ideas and might have to be my own Secret Santa this year – because, believe it or not, my only quilty friend lives in (are you ready for this?) – Tasmania. While I live in Canada. Hehehehehe….Thanks for another great post – and all the best of this lovely season to you! where can we find the special edition magazines? I have the frivols but haven’t started to use them yet but plan on filling them up as I empty them with sewing things. Like that the book you show has the spiral bound – more should be so they will lay flat. Where can I find the toweling?? Would love to give a few as tuck in gifts – and save some for me too! Great post, Carrie! I appreciate your tips and opinions. I love little house pins and tulip pins! They really are a joy to work with! You’re teasing us with some wonderful gifts! Great ideas!!! 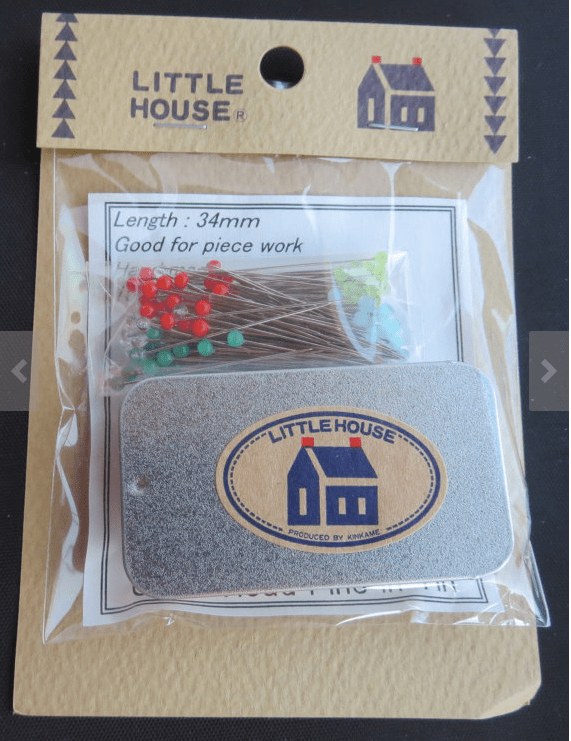 I’m a HUGE fan of the Little House pins also. Heaven knows I didn’t need anymore pins in my sewing room, but I liked the little tin they came in so I bought them last year. WOW! It’s amazing! They’re amazing! You’re amazing! Christmas is amazing! I wish Santa would bring me the Frivols, but he tends to shop for things HE thinks I need. Merry Christmas!!!! Dade City, Florida….. Great Memories! I love that recipe, been making it for about 49 yrs now! And nothing beats Little House pins for accurate piecing. And now I am off to find toweling! Thanks for the great ideas Carrie! I loved this post! I am a kitchen towel junkie too. LOL I’ve made Hermits before, but never as logs~ I like that idea. Have a happy day! I love this post! 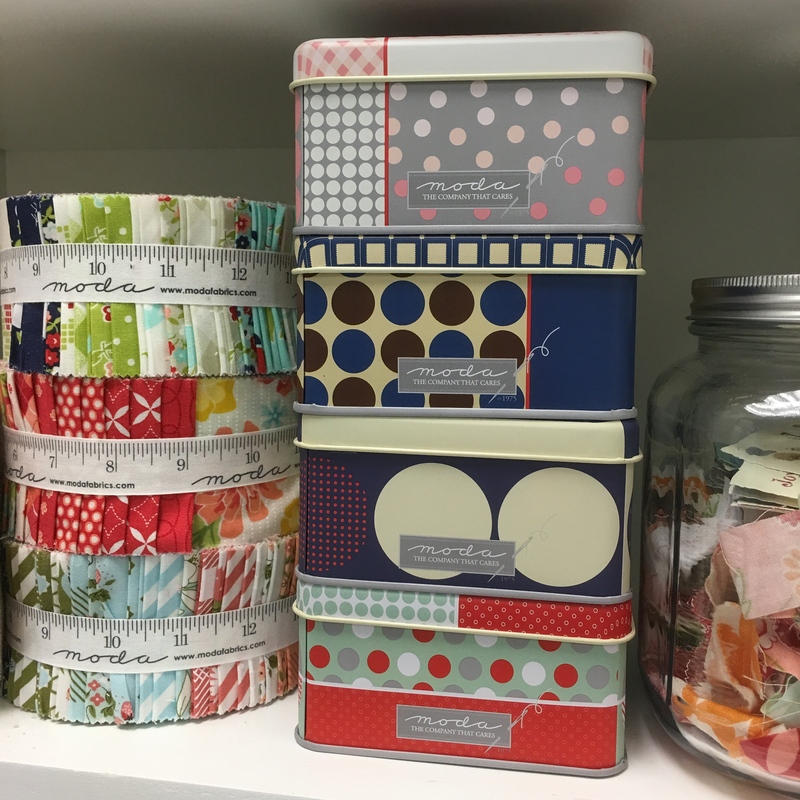 So many great gift ideas and I love your ideas for the Frivols tins. Love the Little House pins and Tulip needles, as well. Thanks! Sandi from Dade City here.. I am glad you are still making those hermits. I am not allowed to come to any quilting gathering without those hermits. Where do we get the toweling? I would love some! Ask at your LQS for the toweling. I know mine has the red stripe online, but also carries other ones in the shop. http://www.prairiepointjunction.com If you call them, they will tell you what they have & you can order from them. Thank you SO much for featuring my book!! I would so love to try the French General toweling. But. Where can I get it?